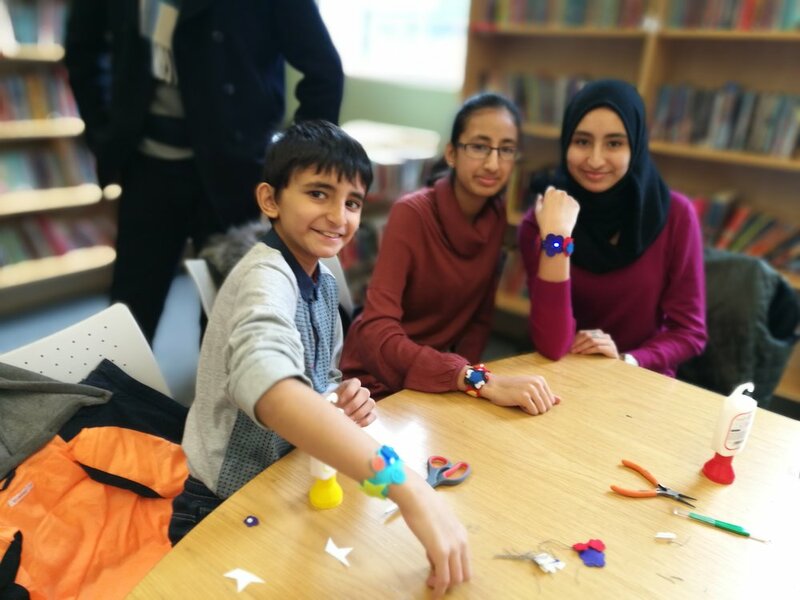 After successfully winning funding from the Trafford Housing Trust, Women of Wearables delivered wearable tech workshops at Sale Library in Manchester to 35 kids (and some adults!) over the February school holidays. Our workshops enabled girls (as well as boys, mums, dads and grandmas) learn how to make their very own light up bracelets using conductive thread to build a circuit and sew the LEDs into the bracelets. While they built the tech and learnt about electronics, the best part of the workshop was decorating their bracelets to suit their own personal style. Because wearable tech should be about the fashion as much as about the tech. While our workshops were set for girls aged 10+, we had a range of people attend our workshop including 3 year old Quinn who loves anything flashing or glowing to Niamh’s grandma who came to drop her off but ended up staying as we had a spare seat for her. We had Percy who had trouble with sewing so he enlisted Aunty Rachael, one of our lovely trainers to help him with the needles while he learnt about the circuitry. Harold was enthralled by the crocodile clips while his mum Valerie was determined to get his bracelet working. While she ran out of time at the workshop, we gave her some supplies and she emailed us at 12.40am that she finally got her bracelet working! That is one determined mother who initially came for her kids but is now inspired to learn more about circuitry and wearable tech. Even our dads Claus and Raj who only came with their daughters because their wives couldn’t make it. At one stage Claus’s sewing was interrupted by his wife calling asking how the workshop was going and he explained he had to go because he was busy sewing! We had a brilliant week delivering our workshops to the community of Trafford. We didn’t know what to expect as this is a new kind of workshop that provides not only hands on crafting, but learning about circuitry, batteries, electronics and sewing and the best part was the kids were able to wear what they made and enjoyed decorating their bracelets. It couldn’t have happened without support from the Trafford Housing Trust, Sale library who were so kind to allow us to use their venue, our lovely STEM Ambassadors who volunteered their time to give back to the community, Barclays Eagle Labs who allowed us to use their equipment to prepare our wearable tech kits and to the parents who invested in their child’s future. It takes a whole team to encourage girls (and boys) to learn about technology and it was an absolute pleasure for Women of Wearables to help teach kids about wearable tech. Because they are our future. We all had a fab time making the bracelets - an educational activity (with the circuitry) but with a quirky twist that allowed us to spend some quality time together doing something completely different that I never knew was possible. We can't wait for the next session. Great to meet other local young families! You and the other ladies helping were so friendly, patient and helpful! Thank you so much!